Our main concern is that it’s not just Greece. Ireland and Portugal are in very similar predicaments, while Spain’s economy, with twice the debt load of Greece, remains in deep trouble with 20% unemployment and tightening debt markets. Italy, with three times the debt load of Spain, also remains on shaky ground. If the periphery is going to survive, there has to be some path to growth/recovery. As yet, there is none. Austerity programs have dented growth and shrunk the tax base. Data for the last week show that the ECB, inexplicably, is contracting high-powered liquidity at more than a 10% year-to-year rate. Broad money across the zone is weak. Peripheral debt spreads are in the stratosphere. And funding costs are inching ever higher. To us, this is a setup for the weakness of the periphery to spread into the core, rather than for the strength of the core to lift the troubled periphery. Therefore, we would be inclined to “fade” any rally related to “kicking the can” farther down the road in Europe. Maybe my fiddling while the Eurozone burns analogy is off. 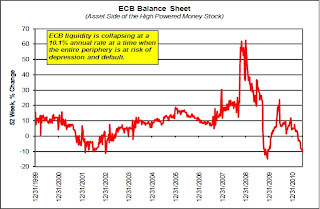 The ECB is actively reducing the monetary base which suggests an image of the ECB putting down the violin and throwing some gasoline on the Eurozone burning. My fear is that the weakness in the Eurozone periphery may spread beyond the core and into the global financial system. Update: Michael T. Darda talks about the tightening of ECB monetary policy with the Wall Street Journal. A stupid question perhaps, but given their current mandate why isn't it appropriate for the ECB to tighten? My understanding is that their current legal mandate is price stability, - in practice defined as a HICP inflation rate at or below 2%. If i understand correctly this indicator is currently about 2.5% which means that the ECB should raise tighten, no? I totally get your argument that this is highly inappropriate for the peripheral countries and that the whole thing is just a mess, but should we expect the ECB to just ignore their legal mandate? Nervousnextdoor, inflation targeting policies should be forward-looking. Shouldn't we rather consider market-based expectations for future HICP? On top of everything else, what sense does it make to slow an economy down when you are overindebted? If a business, individual or nation has too much debt, you want to boost economic output to reduce relative debt loads. And thereby pay down debt. Shrinking economies is always a bad idea, but especially when overindebted. The ECB should put inflation-fighting on the backburner for a while, and concentrate on long-term fiscal austerity and loose money.